JACKSON, Miss. – Cameron Champ’s booming drives have made him quite the curiosity during his short time on the PGA Tour. The rest of his improved game has turned him into a contender this week at the Country Club of Jackson. Champ shot a 7-under 65 on Thursday to take the first-round lead Thursday in the Sanderson Farms Championship. Cameron Tringale was a stroke back, and Rory Sabbatini, D.J. Trahan, Andres Romero, Chad Ramey and Robert Streb followed at 67. There were still 12 players on the course when play was suspended because of darkness. Seth Reeves was at 5 under through 16 holes. Champ’s drives sliced through the wet, windy and unseasonably cool conditions without much of a problem. On the par-4 18th, he blasted a 347-yard drive and hit his approach to 4 feet to set up his fifth back-nine birdie. The 23-year-old earned his PGA Tour card on the Web.com Tour last season. Even more impressive about that 347-yard drive? He wasn’t really going for distance because of the weather conditions. Champ played in college at Texas A&M and said the windy conditions in that area of the country have given him plenty of practice for dealing with what he experienced on Thursday. He kept most of his drives in the fairway, which allowed him to have a solid day with his short game and putting. The slender 6-foot, 175-pound Champ doesn’t look like he’d be one of the tour’s biggest hitters, but he’s consistently among the leaders in that category. He averaged 328 yards per drive on his way to a tie for 25th at the Safeway Open this month, which is the only other event the rookie has played this season. 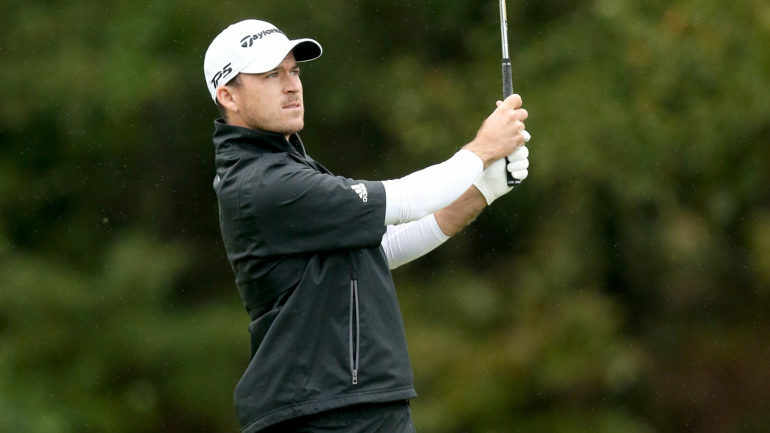 Former champion Nick Taylor of Abbotsford, B.C., carded a 3-under-par 69 to share 18th place. The 31-year-old Tringale made the cut at the Safeway Open three weeks ago and had another good performance during Thursday’s first round. It’s an encouraging start to the season for someone who made just seven of 26 cuts last year. Tringale said better drives have allowed him to be more competitive. “It’s definitely nice to have a good opening round like this in this tournament and just something to build off,” Tringale said. “I’ll take all the positives I can and replay the good shots in my head tonight. The soggy conditions in Jackson are expected to give way to much better weather during the final three rounds.